Lithander, thanks for sharing this, especially your flixel code! To get your sample to run I had to copy the tileset png to the bin-debug/data folder, and also had to recompile the swf with -local-with-filesystem. The object and property handling in your TMX loader looks really useful. I have to give Tiled a closer look. Thanks for your feedback. You shouldn’t need any png’s in bin-debugdata because everything except the level file should be embedded in the swf. But I had a typo in the compiler parameters causing the sandbox issues. Should be fixed now! If it still doesn’t work for you please let me know! You only need the png to load in Tiled (or else you get an error). With your .tmx everithing works, but I downloaded the newest Tiled, and if I edit the .tmx with Tiled and save it then press Enter in the flash, its hangs up. I think I downloaded a newer version of Tiled, I”am? Yeah, same thing for me. If i edit the map with tiled the game hangs up when I load the map. But I can edit the file by hand in a text editor and there it works. It should work even with the most recent version of Tiled. The only thing that comes to mind is that the editor might save the changed map in a different encoding then it originally was. Please go to Edit/Settings and set an encoding that is NOT gzip compressed. Does that help? Thanks, that was it. I think the default is gzip so that was the problem, I changed it to zlib and it works great! Nice post! I’m not a Flash developer but I will try it out sometime. I think I will change the default compression to zlib, since this is generally easier to decompress than gzip. The current default dates back to the Java version of Tiled, which only has Gzip input/output streams. 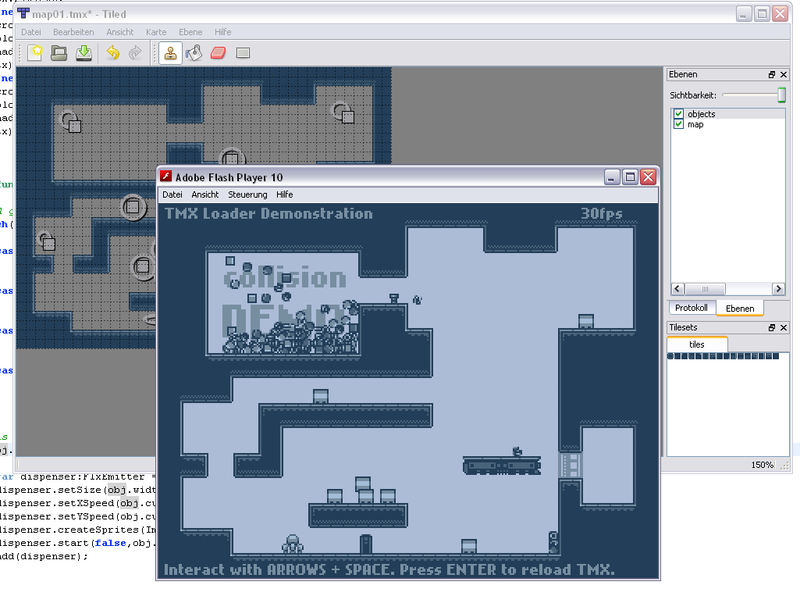 Seems like an interesting program and way to get it into Flixel, but Tiled is giving me problems with your map01.tmx (other tmx files work fine). The error code that Tiled gives reads: “”Error loading tileset image: C:/blah blah … Line 5, column 29.” I think dobosbence was right — Tiled tries to look in the .tmx’s folder for the tileset that the map is trying to use. Moving tiles.png seems to do the trick. The objects layer is interesting! Should prove to be a cool tool for our new game. One question, though: do you think a slanted floor would be better represented as a tile or a special object like the elevator? I’m thinking the latter so that collision can be measured differently (partial-allow rather than just keep-out). I can send the source anyone who interested. 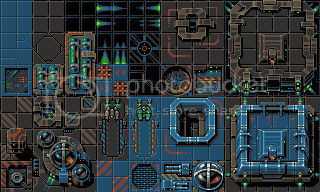 I can only get this to work with the tiles.png graphic but not my own; are there restrictions like size? Thanks. In the demo the tileset is embedded in the application: [Embed(source="data/tiles.png")] private var ImgTiles:Class; Make sure that source points to the correct location and recompile the demo! Przemeko: I’ve made a version which loads the tileset as PNG also (and I fixed some bug also). I can share the source if you want. @dobosbence: If you’ve got an improved version that you want to share I can host it and add a link to the post. Contact me per email! Any chance you could be persuaded to see if this works on the Master branch of Flixel? 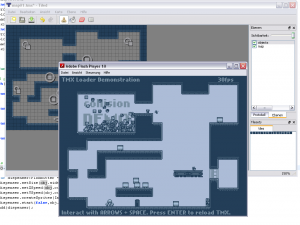 I love using Tiled, and it would be nice to use it for building maps in Flash. Hi Lithander, I was wondering why I can’t make mine to work? I’ve even took out some of the irrelevant codes to make it to work but I can’t unfortunately make the map to show. If you want to focus on code use Adobe Flash Builder. Otherwise use Adobe Flash Professional.